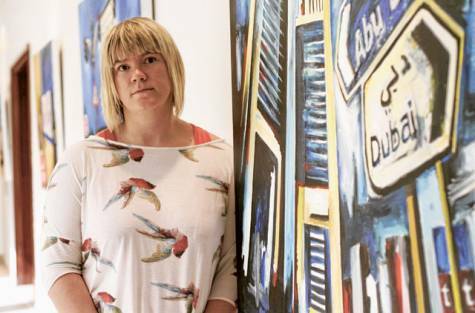 Dubai: Sarah Jackson’s paintings are recognisably based in Dubai — but this isn’t just because some of the works depict iconic buildings. Many images, paintings and artworks show the famous architectural side of the emirate, by including representations of landmarks such as the Burj Khalifa, Burj Al Arab or Emirates Towers, amongst others. * Image Credit: Karen Dias/Gulf News * Jackson at the exhibition First Glance at Dubai Ladies Club. Jackson admires the work of French Cubism artist Robert Delauney and Manchester artist Liam Spencer. However, as Jackson told Gulf News at her inaugural solo show recently, she wanted to include a more local element in her representations of life in Dubai. “Dubai itself is constantly changing. If you were to search on the internet ‘paintings of Dubai’, you might get some postcard images of the Burj, but there are no actual real images or real scenes of Dubai,” she said. Her acrylic on canvas paintings therefore depict ‘real’ scenes of the emirate, such as a speeding car on Jumeirah Beach Road; construction workers queuing to board a bus home at shift-change time; or men using phone booths to call home. A theme that’s central to her pictures is the depiction of blue Dubai road signs. “Dubai is one of the fastest growing cities in the world, which strives to build the biggest and best in almost everything. Within my work I focus on the freedom explored in construction; the juxtaposition of rich blue skies with city smog; new street signs erected daily; traffic grinding to a halt during rush hour, construction workers lined up, Emiratis rushing to the mosque and the speeding cars down the beach road,” she said. Jackson has been a resident in Dubai for three years, and is a full-time art teacher at Jumeirah College. Having gained a degree in Fine Art from Manchester University in the UK, she had the choice of studying for a Masters Degree or taking the PGCE (Post-graduate Certificate in Education) necessary to become a teacher. Deciding to take the PGCE, Jackson said she “always kind of knew” she wanted to be a teacher. After a few years of teaching, she said she knew she would get back into painting. Her goal has been to do 10 paintings this year and she has been painting every weekend for the past six months. The whole “First Glance” exhibition took her between four and five months to complete. Getting the exhibition off the ground, however, was difficult she said. “I sent hundreds of emails to loads of galleries. I’m not a known person in the art world and it’s my first solo exhibition. People want to exhibit known names. “This is hopefully a platform and now I’ve got this body of work, this is something I can build on,” she said, adding that she was “lucky” to be offered the space at the Dubai Ladies Club where the paintings are currently being shown. Jackson admires the work of French Cubism artist Robert Delauney, particularly his “idea of viewpoints and the fragmented elements of the images”, she said. She also admires the work of Manchester artist Liam Spencer, who uses “really dramatic lighting and shadows”, she said. While Jackson hasn’t made a plan to show the exhibition when this showing finishes, she said: “If someone would like to offer me a gallery space, then that would be brilliant”. When: Until Monday. Open 9am-10pm, closed on Friday. Men are welcome if they use the side gate.